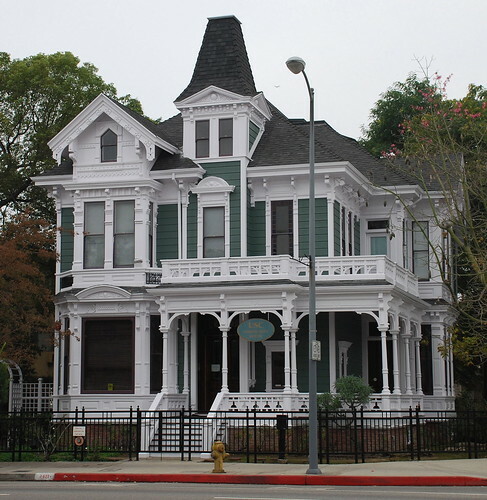 If you’re interested in visiting all of Los Angeles Historic-Cultural Monument No. 103, you’ve got some driving to do. 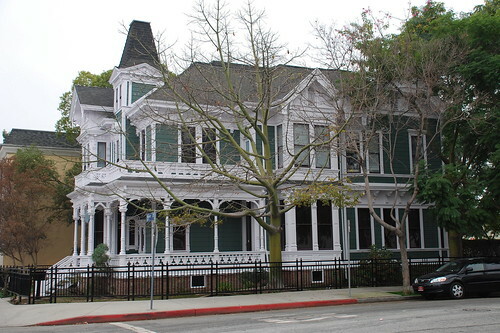 Sometime in the 1880s, Burgess J. Reeve designed a 4,200 square foot, eleven-room Victorian mansion for John A. Forthmann. 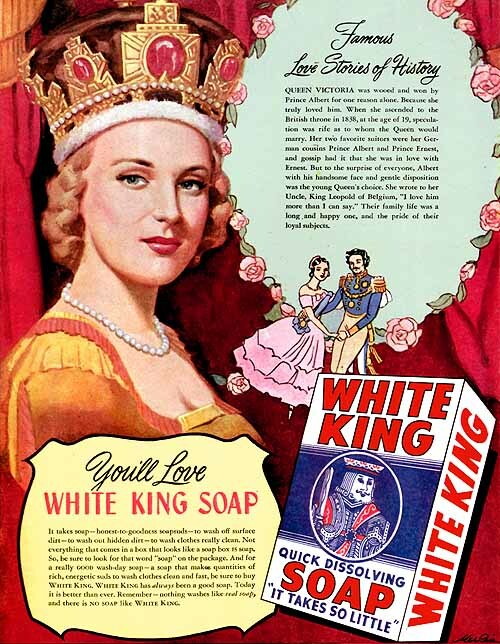 Forthmann, a German immigrant, had made his money from founding and running the Los Angeles Soap Co. The business, most famous for its White King brand (“It takes so little”), at one point covered about sixteen acres of downtown. Forthmann died in 1922. In the shot just above, from USC's Digital Archive and taken around 1900, John Forthmann is one of the guys in the buggy. Probably the cleanest one. Because he was in the soap business. 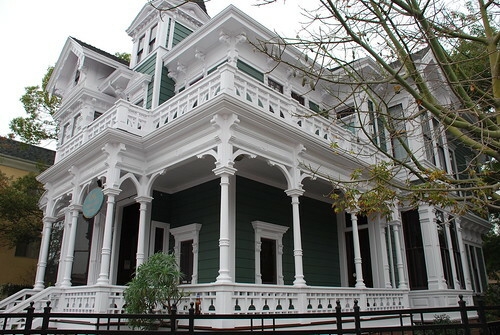 Different references mention different styles of the house, but mainly as a mix of Italianate and Eastlake. 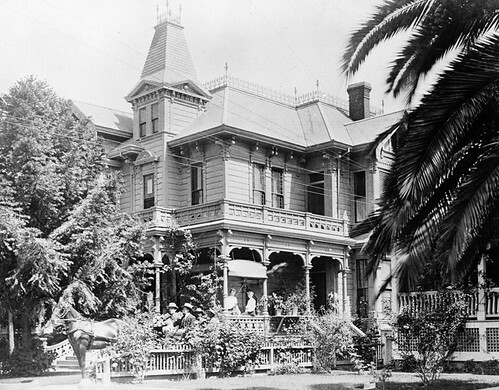 The house, along with its carriage house, stood at 629 West 18th Street, just off Figueroa. Flash forward a century. 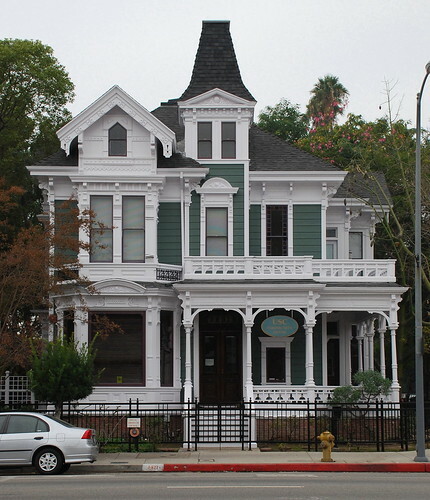 In 1989, about seventeen years after its designation as a city landmark (and about a year after the Los Angeles Soap Co. finally closed its doors), the house was picked up and relocated to its current location on Hoover. According to Historic Places in Los Angeles County, published in 1978 by the Historical Society of Southern California, several additions had been made to the second floor at some point. 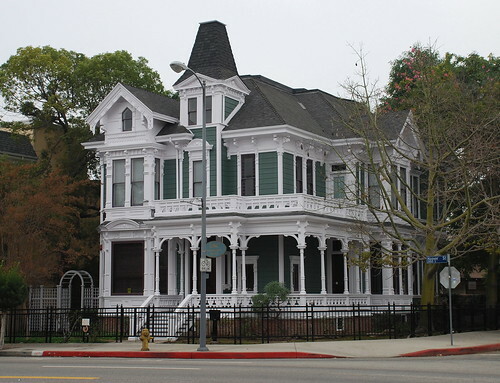 Today the home – one of the oldest in the city – is the headquarters for USC’s Real Estate Development Corp. I hope you're sitting down, because here's a shot of the back of the building. The bad news? When the house was relocated, the Forthmann Carriage House was left behind. The good news? 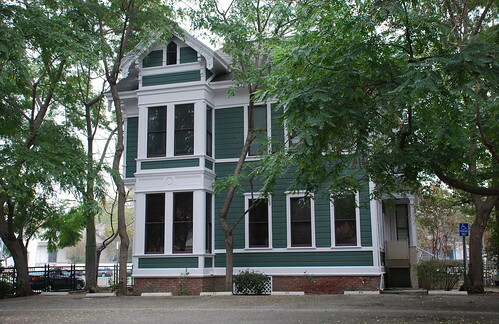 Sixteen years later, in 2005, the carriage house, officially part of HCM 103, was saved from demolition when it was moved, in the opposite direction of its old partner, to 812 East Edgeware Road in Angelino Heights. It stands there today, fairly well stripped and awaiting restoration. 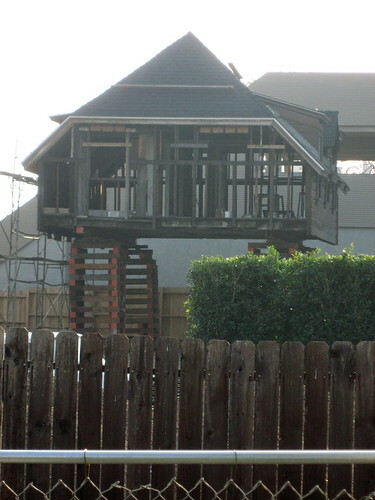 If anyone can tell me why it’s perched so high up on stilts, please do. Maybe just waiting for a foundation, I reckon. Oh. Below is a picture of the house and carriage house's original location, on West 18th Street. 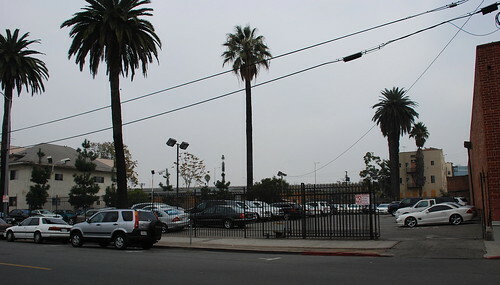 The site's about one block south of the Santa Monica Freeway and one block east of the Harbor Freeway. Somewhat ironic, as Forthmann insisted using a horse and buggy until the day he died. You can bet he'd be really thrilled if he were alive today. Really thrilled, and really old. 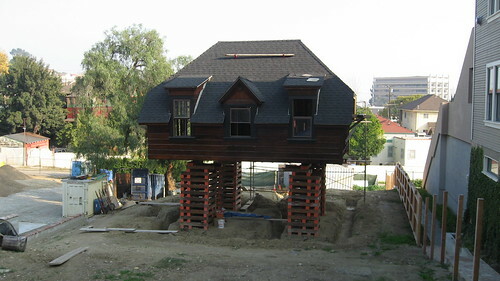 I thought the reason for the height was for laying a foundation, but my husband added that the carriage house might be that jacked that high in order to turn it into the second floor of another building in addition to performing foundation work. The dormer windows certainly have a "second story" look to them, don't they? He may be right. I had been thinking that's a large piece of land for just a converted carriage house, and that a bigger home would be built in front of it. If it will be a second story, hats off to creativity. You've reunited me with an old friend. I worked downtown L.A. from 1979 to 1994 (15 years). My commute would vary starting from San Pedro approaching L.A. from the South West on the 110 (Harbor Freeway) or starting from Long Beach approaching L.A. from the South East on the 710 (Long Beach Freeway). From the 110 near the coliseum, when the freeway emerges from below street level to above street level, I would first sight the skyline, of course, but then I would see this house standing alone surrounded by commerce, mostly car dealerships as I recall. I could not see the carriage house from there, but one lunch break I visited the place. The reason the carriage house has elicited comment is because the picture shows only the second story atop those pilings. The carriage house itself was two story. The bottom floor had large doors for the carriages to come and go. Whether someone lived above or that is where they kept the hay, I don’t know. The question is, where is the first floor? Then, after my Long Beach commuting, I was back on the 110 and the house was gone. The car dealership had expanded its lot. I thought, surely it was not demolished for a parking lot, although such things did happen in the 1960’s. I thought it was either moved or caught fire. I did not know it was a monument or the name of it, so I never followed up on finding out what had happened. All I knew was that a very unique L.A. Victorian had vanished. Although this architecture can be found elsewhere, I cannot think of another in L.A. that has the center tower (please correct me if I‘m wrong). I will now have to visit her again since I now know where she is. It’s nice to see that she has been so beautifully restored. Thanks for the update. The first floor was essentially demolished prior to the move over City staff objections (to make the move cheaper). Unfortunately, this project is being undertaken by a someone has has done a few similar neighborhood projects which don't quite meet the higher standards of preservation (including the controversial Angeleno Heights Neutra relocation).